Francis is drifting away from it. 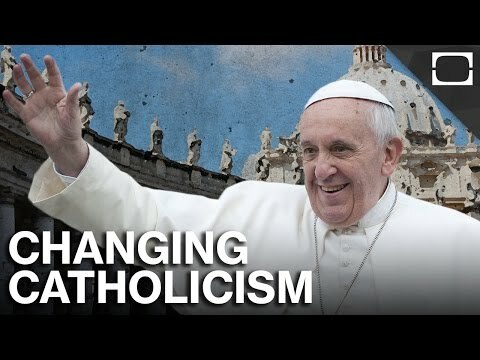 So how is Pope Francis changing the church? "Pope Francis has issued a stark warning to Roman Catholic religious orders: help alleviate the escalating refugee crisis in Europe by hosting asylum seekers, or pay taxes, like everyone else." "Six months into his papacy, Pope Francis sent shock waves through the Roman Catholic church on Thursday with the publication of his remarks that the church had grown "obsessed" with abortion, gay marriage and contraception, and that he had chosen not to talk about those issues despite recriminations from critics." "For generations, homosexuality has largely been a taboo topic for the Vatican, ignored altogether or treated as "an intrinsic moral evil," in the words of the previous pope." "Pope Francis is expected to raise issues ranging from climate change to income inequality when he visits Cuba and the United States Sept. 19-27." Music Track Courtesy of APM Music: "Vorsprung"
TestTube News is committed to answering the smart, inquisitive questions we have about life, society, politics and anything else happening in the news. It's a place where curiosity rules and together we'll get a clearer understanding of this crazy world we live in.